Coral reefs and other benthic marine ecosystems play a very important role in the biogeochemical cycles of our oceans. However, laboratory based study of these environments ranges from being difficult to actually impossible. In order to look at the microscopic-scale processes that occur in the benthic environment a team of scientists developed the Benthic Underwater Microscope (BUM). 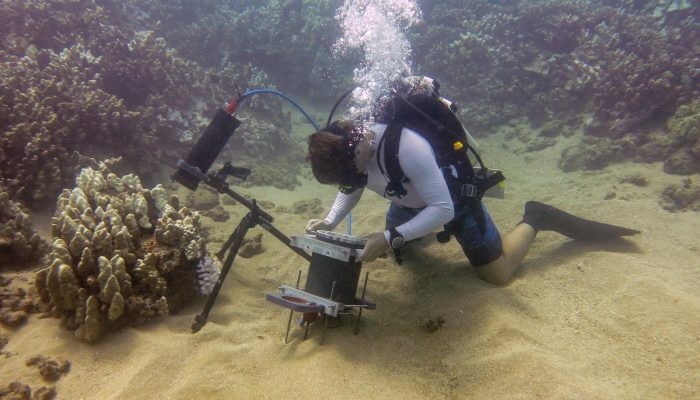 The device, which can be deployed by a diver in situ allows for imaging and filming microscopic processes occurring on corals reefs. The microscope can be used to observe coral polyp behavior, and the behavior of symbiotic organisms living inside the coral. Scientists have also found that it can be used to observe the recolonization of bleached corals by micro algae. To read more about this new imaging device see the original paper by Mullen et al., 2016, and here is the device in action.